Hotel Benini, 4 star hotel in Milan Marttima, with swimming pool, parking, garden and WI-FI connection throughout the entire hotel. Accepts pets of all sizes. Directly on the sea, the property enjoys direct access to the beach from the garden. Behind the hotel is the centuries-old pine grove, while the city center is about a 10-minute walk away. All rooms have sea view and are equipped with balcony, air conditioning, WI-FI, satellite TV with Sky and digital terrestrial, safe, telephone, minibar, bathroom with shower (or bathtub) and hairdryer. SUITE: located on the hotel's panoramic floor. The hotel has a swimming pool with Jacuzzi and a children's pool, a garden with gazebo, chairs and tables, solarium area, hall, reading room with newspapers on request, satellite TV with Sky channels, lift, laundry service, bicycles and beach towel for free use. On request, airport / station shuttle service for overnight stays of at least 7 days. LUNCH AND DINNER: 4-choice menu, 2 side dishes, buffet of appetizers, cheeses, desserts. Pasta and desserts are homemade. VARIATIONS: vegetarian and gluten-free cuisine. Possibility of personalized diets. In hotel: swimming pool with shallow water. Pediatric consultation on request. 105 sqm pool with a fixed depth of 140 cm. It is located in the garden with heated water, hydromassage corner and solarium area around (with sun loungers and WI-FI connection). 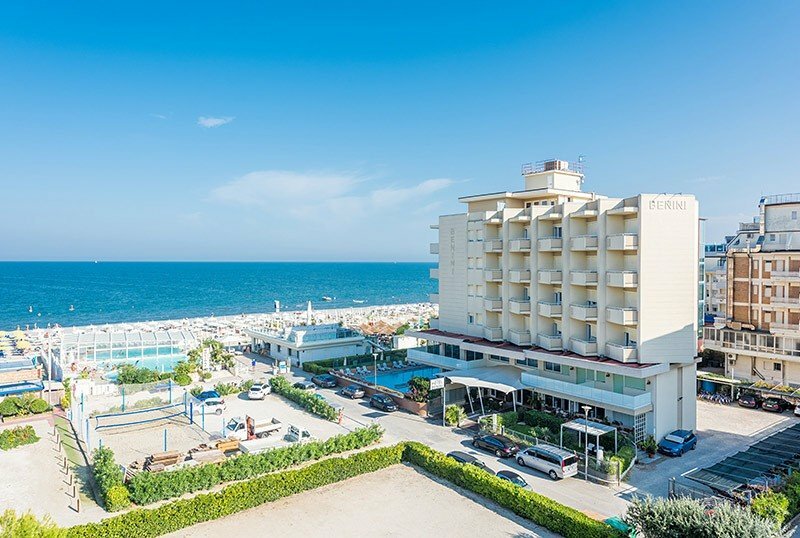 The hotel has an agreement with the Bagno Holiday Village bathing establishment, directly accessible from the property's garden, with 3 swimming pools and services for adults and children. - Euro 92.00 full board. Request a custom quote. Bathroom with indoor pool.